Guess who’s on today’s issue of Sunday Inquirer Magazine? 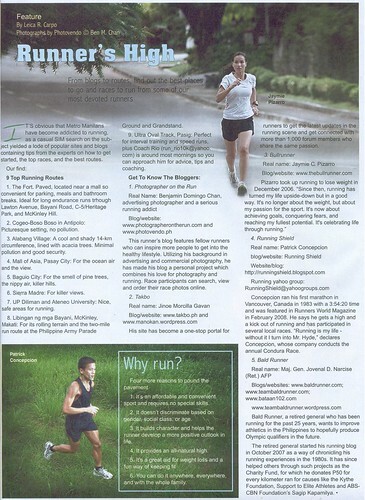 The next article is about the 9 top running routes and 5 bloggers/websites, namely Ben, Takbo.ph, Running Shield, Bald Runner, and TBR. Thanks to Leica Carpo for the feature! Congrats to good friend Ben Chan (Photovendo) whose photos practically filled the entire magazine! TBR Turns 10! And, I’m Another Year Older, Too! I really am so proud of you, Joms, Pat and Ben. You’ve done so much to promote running as one of the best exercises. More power to all of you! Congrats Jaymie! Hope you’re feeling better on your knees. Hope to see you at the race soon! Needless to say I read the articles on last Sunday’s paper that is why I’m posting here. Can someone point me to where I can learn proper foot landing? Many say that I should land mid-foot/forefoot. But I always land on my heels and have a very, very hard time landing mid-foot/forefoot. I do land mid-foot/forefoot when I do speed intervals but when it comes to slow running, I always land heel first. I suggest you try the following exercise, to stretch out that iliotibial band. Lie down on your side and slowly abduct the affected leg, with your knee flexed about 90 degrees. When your thigh has been abducted around 45 degrees, slowly extend your knee. This will stretch out that tight itb, and strengthen the muscle which is connected to the itb, which is the tensor fascia lata. That uphill stretch along country club drive is really murder, but once you’ve reached the end of it-hayyy sarap..
it’s not a fair world, you should have been on the cover! Leica C. Did a very nice write up on us. Congratulations to all. But most especially to Mr. Ben Chan “ Photographer on the run “ he really took excellent pictures of all of us . aww wow! 🙂 you keep inspiring lots of people! Good work! and so with b3n! You just gave me a reason to go out and buy Inquirer!!! 😀 Woohhoo… Congratulations! Congratulations on the inquirer article. First time I visited your blog. 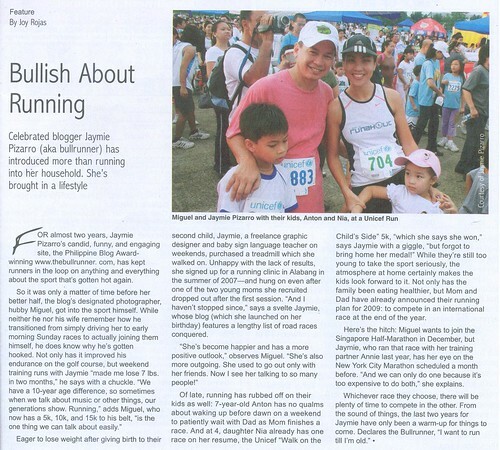 I gather that you run inside Ayala Alabang village, from the photos. What is a good 10k route in the village? Congrats. Good to see you get more attention.